As a cassandra sangue, or blood prophet, Meg Corbyn can see the future when her skin is cut–a gift that feels more like a curse. Meg’s Controller keeps her enslaved so he can have full access to her visions. But when she escapes, the only safe place Meg can hide is at the Lakeside Courtyard–a business district operated by the Others. My rating: 3.5/5 Stars – Could’ve been better, but I liked it overall. 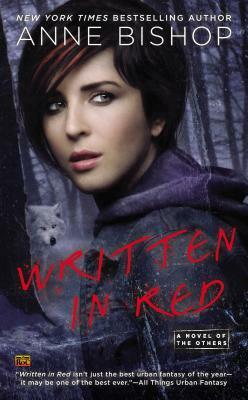 Written in Red is a different kind of urban fantasy. Although it’s certainly not boring or slow, it has an almost slice-of-life feel. There’s a strong theme of community running though the entire novel, like a small-town mystery except with supernatural creatures. The protagonist, Meg, possesses a childlike innocence that makes her different from other UF heroines. She’s inherently trusting of people she doesn’t know; she takes great pride in a job that’s relatively simple and unskilled; and she goes out of her way to be friendly to creatures a logical, informed person should fear. Meg survives not because she’s smart or strong, but because the Others recognize that she’s different and adopt her as one of their own. Ultimately, this isn’t a story where the heroine saves the day; it’s a story about family. The Others themselves are both cartoonish and horrifying. One minute the werewolves are acting like adorable puppies and the next they’re tearing into someone’s guts. I’m honestly not sure if I like this characterization or if I hate it. The one aspect of the story I loved unequivocally was the interactions between the human community and the Others. Watching Officer Montgomery slowly develop a relationship with these creatures – and seeing what each side thinks about it – is fascinating and perhaps the most compelling part of the novel. In short, Written in Red is not at all what I was expecting, but I still enjoyed it. The world Bishop has created is a unique and interesting place. I definitely wouldn’t mind returning to it in the future. This entry was posted in Review and tagged 3.5 stars, Anne Bishop, books, reviews, urban fantasy. Bookmark the permalink.